Crown measuring 5 3/4" to 6"tall before shaping. Center creased. Star vents in the crown. Star vent pattern copied from an original. Wool felt versions have the correct turned under brim with two row brim stitching. Fur felt versions may be ordered with or without the turned-under brim. 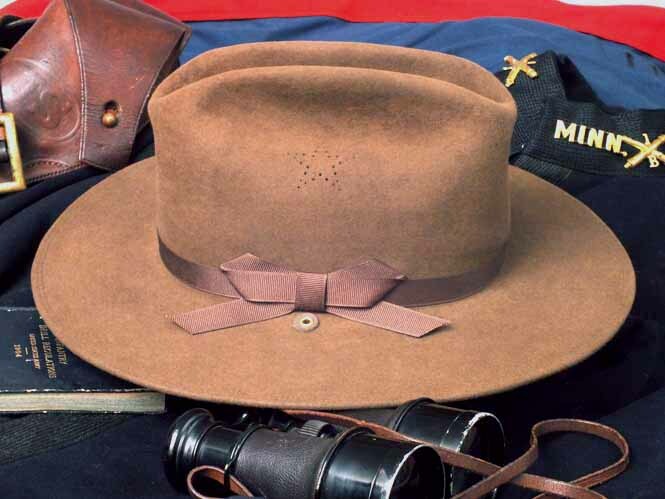 In an 1897 economy measure, the U.S. Army reduced the weight of the hat bodies to the point that the brims became more floppy. The doubled brim of the 1904 pattern hat was an effort to retain the shape of the brim. 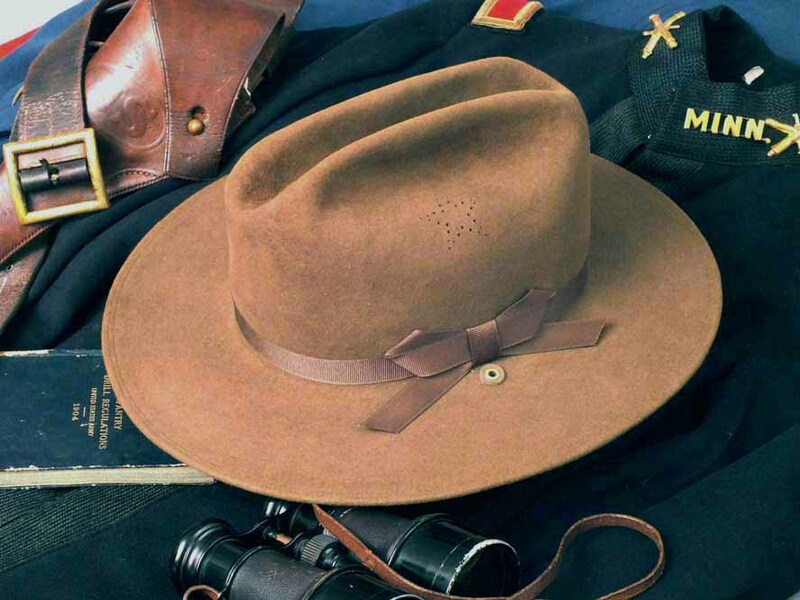 High quality fur felt hats, then as now, are frequently thicker than the post 1897 bodies the Army specified, so sometimes it is or is not possible to turn the fur felt brims. It just depends of my stock. Reinforced chin cord eyelets in the brim. Chin cord furnished. Wool felt reproductions have a leather sweat band, 2 1/4" wide, turned at the top edge. I usually recommend that purchasers of the fur felt hats retain the original 1 3/4" sweat bands that already adorn the Stetson or Resistol bodies, even though they do not conform to the 1904 specifications. Hat body is available in wool or fur felt. Our fur felt hats are not always available. Please call to confirm availability and features desired, if you are ordering a fur felt hat. 1904 Campaign Hat - fur felt reproduction. Note turned-under brim and reinforced chin cord eyelet. 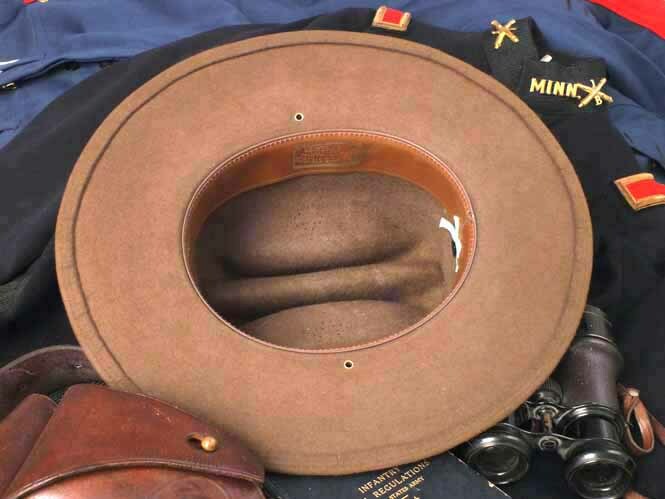 1904 Campaign Hat - Eureka Arsenal reproduction in fur felt. 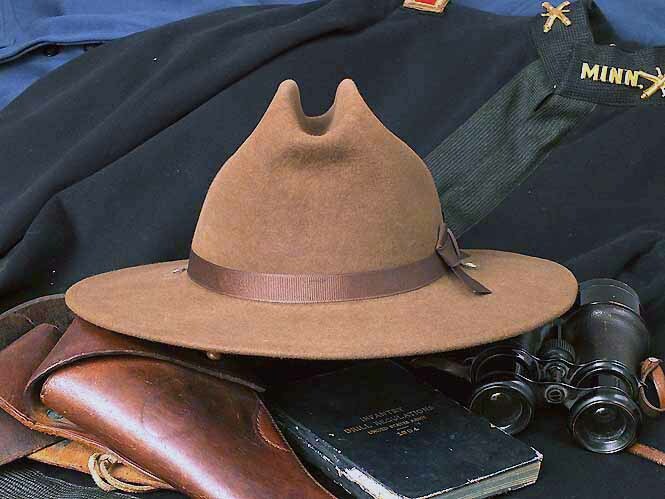 1904 Campaign Hat - Eureka Arsenal reproduction in fur felt, based on a Stetson 4x beaver hat. 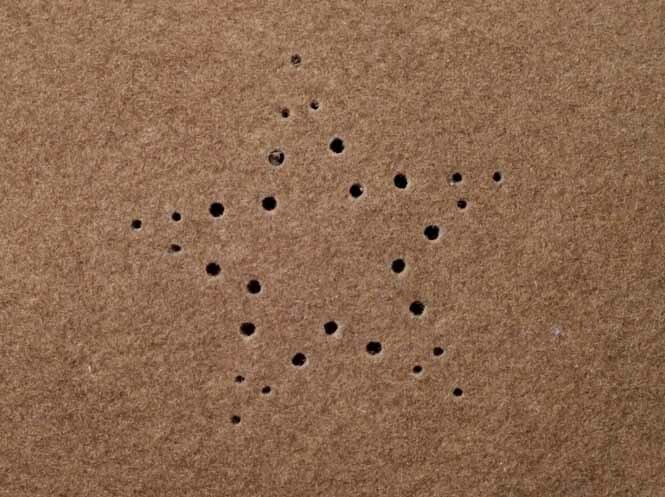 Close-up of star vent - details copied from an original by Horstmann.